In Greek mythology, the goddess “Iris” was considered the personification of the rainbow, and the “messenger to the gods,” the one who created the rainbow to transfer messages from the Gods to the people on Earth. No surprise with the many showy colors of these blooms. These perennials are a favorite in many flower gardens, but lately they’re being sought after for something else that they offer. Cells from a particular kind of Iris, called “sweet iris,” are now recognized as having some pretty amazing anti-aging benefits. 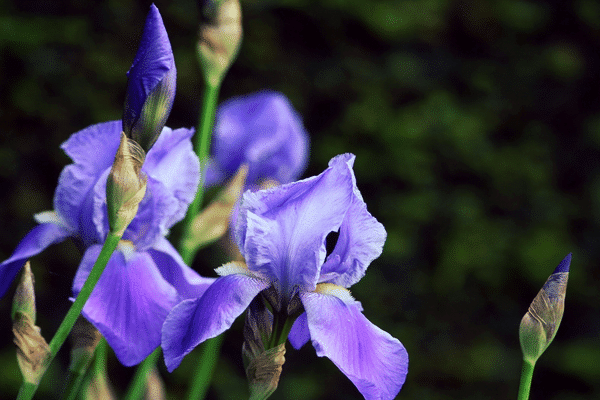 After learning more about this naturally beautifying ingredient, we found an amazing source and are now including sweet iris plants cells in our Anti-Aging Eye Cream. Let’s talk about why this plant is so beautifying. What is the Sweet Iris? The Iris genus consists of up to 300 species of flowery plants, of which sweet iris is one. The sweet iris has light lavender-blue flowers with yellow beards, and is more shade-tolerant than other species. It usually grows about two-to-three feet tall, blooms in the spring after the tulips and daffodils, and likes rich, well-drained soil. The sweet iris has sword-shaped, gray-green leaves and a light fragrance popular in perfumes and breath fresheners. It is said to have originated in Italy, but also grows naturally in North Africa. The plant has a root called a “rhizome,” a potato-like root often visible above the surface of the ground. These roots were known to have health benefits in traditional medicine. You probably already know that as we age, the skin gradually loses its shape which leads to sagging, bagging, and fine lines and wrinkles. For a truly anti-aging effect, you need a solution that helps make it look firmer and more taut. Research has revealed that the active plant cells in sweet iris leaves have the unique ability to encourage a tighter, firmer, more youthful look. At the same time, sweet iris has a moisturizing capability too, softening and plumping skin. We recently reformulated our Anti-Aging Eye Cream, making it more potent while still safe for sensitive skin. Sweet Iris cells were the perfect addition —they’re preservative free, non-allergenic, biodegradable, and easily recognized and taken up by skin. All of this in addition to being incredibly beautifying! See for yourself how this using sweet iris for reducing the appearance of eye wrinkles can change your look. We’re eager to hear about your results! Got questions about our eye cream? Feel free to ask in the comments below!